Hoppy. Deadly alcohol content (in a good way). Great beer, doesn't drink like an Imperial. Best offering I've had from them. Recommend for sure. "Best by 10/9/15"; drank 7/14/15 @ the Yarchives. Poured from a can into a glass. A rough pour yielded a big white head; a frothy curtain of lace. Pineapple & faint vanilla notes in the nose. Pineapple & mango flavors up front; mild vanilla & faint grapefruit notes on the finish. A fruity, balanced DIPA with no booze heat; nicely done! From can but 6 months past exp date. Don't think it affected taste too much. Very easy drinking double but no too strong in flavor. High ABV not very noticeable. Flavors were good, malt hop citrusy mix was easy in the mouth. Would really like to get this fresh next time. I love hoppy Imperial IPAs and I love malty barleywines. I especially love IPAs that can balance the hops and the malt so that they're both present and apparent, but they play nicely together. That's Hop Crisis. Half IIPA; half barleywine - just about perfect. I found it when I was out of town and only bought a single can to give it a try. Now I'm the one having the hop crisis. How am I going to get more of this great stuff??? Poured from a 12 oz can into a pint glass at the Taco Mac in Atlanta, GA. The appearance is a clear copper color with a large white head. The aroma is a nice blend of citrus and pine hops. The taste is very close to the nose. A very good beer. 12oz can with no freshness date. Clear weathered golden color. Off-white bubbly head sticks to the glass like a champ. Soft resin, floral and slightly fruity hops with substantial edge of citric ... alcohol is clean and so is the malt, a pleasing aroma. Smooth and creamy fullish body. Hop bitterness is there, slow moving but it eventually tries to take over the palate. Alcohol is certainly there with a warmth that starts up on the first sip. Big herbal push unfolds into more of a tobacco and citric juice and rind flavor. Oak? Yeah there is a slight pull from the oak which adds a complexity within. Maltiness struggles to make its mark but does come through with some nutty toasted graininess. Finishes bitter with some residual malt underneath. 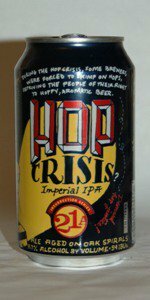 A good run at the style, not many canned craft beers of this strength in the market so Hop Cirsis has that going for it. Hopheads have another option when cans are the only choice. Growler fill from DeCicco's in Ardsley, NY. Pours clear lighter amber, fluffy off white head, thicker collar and leaves way better then average sheeting and lacing all the way to the top of the glass. Pungent citric and pine infused nose. Fresh sniffer. Bold and flavorful DIPA, with waves of citric hops with tropical fruit notes also floating around. Also picking up some mint in this bright and densly flavorful brew. Prolly the best 21st Amendment offering I've had to date. Pours a clear gold with a nice chunky head and sticky lacing. Smells sweet and of caramel and grapefruit hops. The taste really matches the smell. There is a lot of caramel and lots of citrus hops. There's some grass and pine as well as some dark malt to lend some sweetness. Feels smooth and creamy, not at all bitey or unpleasant on the palate. Nice carbonation level and a very smooth sipper. on-tap served in a 10oz glass. appears a golden orangish color, with some haze, slightly fluffy white head. decent lacing as I drank. aroma was of mostly citrus hops. taste is actually fairly balanced, which I enjoy. good malt balance to the strong hop profile. not bitter, and complex, not just a one-note hop blast. fairly smooth mouthfeel, and easy to drink. no hint of the abv. poured from can into a pub glass. Beautiful pour, color almost glowing golden yellow, great head, great lacing. Smell is of balanced hops and sweetness, with a hint of pine resonance. The taste rides a wave, first is the hops, then the citrus sweetness, then the pine. Decent mouth feel, easy to drink, with the pine resonance lasting almost until the next drink. Solid beer, get this brewery distro'ed to MN, just never had this one. Solid brew, would mos def drink again. Poured from can into Delirium snifter. Bottom of can is labeled with the following code: 1102 1643. A: Honey gold with a thick bright head that recedes quickly to lace at the sides of the glass. N: Pine and resin and earth with a defined sweetness in the background. T/M: A citric flavor of pine and spice backed by a solid sweetness which is delivered in the solid and beautiful malt profile. The body feels very oily and thick with a lingering bitterness. Not sure why I like this beer so much--it is a very good beer; I find it more similar to the Mid-West style IIPA, which I experienced while in CO. I really like how the beer features the often under-appreciated piny hop characteristics. I will definitely be enjoying another of theses rather soon.